Stacey Smallwood attended Eastern Kentucky University. There she completed her Bachelor of Science in nursing in 1998 and her Masters of Science in nursing in the Family Nurse Practitioner tract in 2003, as a member of the Sigma Theta Tau International honor society of nursing. 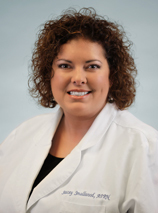 She is board certified by the American Association of Nurse Practitioners and the Kentucky Board of Nursing. She is an active member of the Kentucky Coalition of Nurse Practitioners and Nurse Midwives. Stacey is a native of Stanton, KY. She currently resides in Richmond with her husband and son.